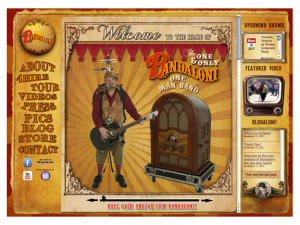 Welcome one and all to the NEW website of ‘The One and Only Bandaloni’! It’s been a long time coming! Much sweat and combined effort has gone into the creation of this new site and I do hope you enjoy it and visit often. I would like to personally thank Adam Jenkins, our new webmaster, Dani Nash for her creative design work, my pal Martin Stevens who has his inspiring fingerprints all over this site and my beautiful wife Pat’s ability to project manage this feat to completion. Kudos everyone! We at Bandaloni central, anticipate a very busy year ahead with the One Man Band show. I encourage you not only to come out to a show, but to also come up and say ‘Hey’ any chance you get. I love hearing others’ stories. Enjoy perusing the new site. We welcome any feedback or suggestions regarding content or navigation. Check back often and always for updates and news….oh, and be sure to ‘Like’ me on Facebook…and bookmark the site. Be Cool & Stay Warm Fan-Aloni’s.